I’ve always been into my tech and as soon as I saw home accounts on Instagram featuring Philips Hue lights, I knew I had to investigate it for myself. I’ve seen some truly stunning arrangements and I put loads of thought into how I could use this to achieve a really modern feature in my home. This particular project took 15 months to complete, but now all my living space is lit 100% by Hue. The only spaces that are not are the “non living” spaces – the downstairs entryway, garage cupboard and eventually the garage itself, which are all on a separate system called Hive that also controls my heating. The loft was also supposed to be getting Hive lighting, but this idea was scrapped due to concerns over the loft getting too hot for the bulbs to safely operate. Never underestimate just how hot a loft can get in the summer! Note that this blog post is not intended to be a technical review of Philips Hue (though I do cover good and bad points from my perspective), nor am I comparing it to any other kind of system out there (there are others such as LIFX, for example). I am simply writing about how I used Hue in my home and also how I achieved splitting a light strip into four sections for my kitchen cupboards and using cables to bridge the gaps. This is quite a common desire for Hue users, yet there doesn’t seem to be much info on the web about people achieving it. I hope that I can help address that issue by sharing my experiences here. White – these just emit a single shade of white that you can control the brightness of. The reading light in Bedroom 2 is one of these. White Ambience – these additionally give you control over the shade of white. You can have a cool white, which is closer to natural daylight and has a blue tinge to it, or warm white, which looks more orange, and everything in between. The hallway and kitchen ceiling lights are White Ambience. White and Colour Ambience – these additionally allow you to set your lights to one of 16 million colours, using the colour picker that the native Hue app gives you. All the other lights are of this grade. One thing that I have always found difficult though is to have groups within rooms, for example the ceiling lights in a group and table lamps in the same room in another group. I’ve always used the iConnectHue app for this, so rooms are also divided into groups, for example “Bedroom 1 Ceiling” and “Bedroom 1 Bedside Lights”. The Hue app recently allowed you to group lights in the colour picker, but this is very recent so haven’t had much chance to explore it and I don’t think it gives me quite what I am after anyway. 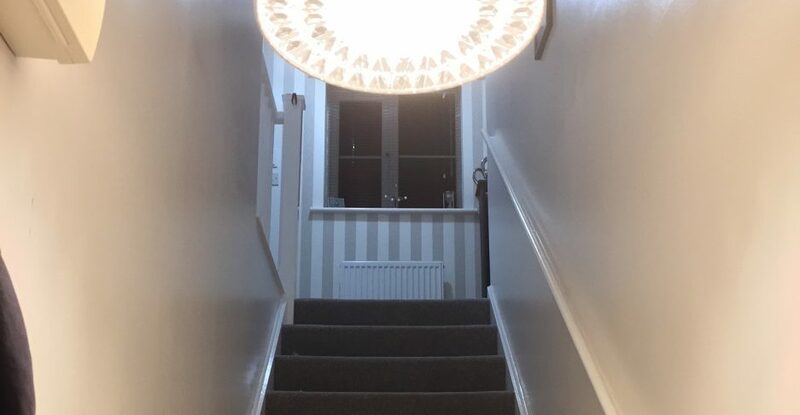 I have the Hallway light set to give a different shade of white depending on the time of day it is turned on. It gives off a cool white if turned on during the daytime, which I might do if it’s a dull day, or a warmer white in the evening. At nighttime, it gives a very dim light, just enough to see what you are doing, as it’s the nightlight setting. The Living Room is the area with the most lights and some are positioned to compliment the TV wall feature I wrote about in my Living Room Transformation post. The lights can actually work with the TV since it is a Philips Ambilight, so you can achieve truly immersive effects when watching movies. I have tried it and it is awesome! I have dimmer switches as well for convenience so I don’t have to keep getting my phone out whenever I want to turn a light on or off. For the Living Room, when I press the On button all the lights come on – holding it down makes the ceiling white and the others pink, to act as a shortcut to my favourite setting. Pressing the Off button once turns off the ceiling, then again turns off the others too. Generally, there are buttons to increase or decrease the brightness and I have these set up to change the brightness in small steps when pressed or jump straight to maximum or minimum brightness if held down. This was the last zone to complete and the hardest to do, simply because of the complicated task of cutting a light strip into four sections and placing them underneath the kitchen cupboards. Me and my dad worked on this initially in December 2017 hoping to get it done for the new year and massively underestimated how difficult it was. Initially, me and my dad tried to solder the individual wires within an ethernet cable onto each of these pads to bridge the gaps between the sections, but it ended horribly. Neither of us had the soldering skills or the equipment to do this effectively and we just ended up making short circuits as we bridged adjacent pads. The light strip was blown and sparks were flying, literally! I didn’t reattempt this until June this year due to budget and my money going on other projects, but when I came back to it I tried a different approach. I did a bit of searching on Amazon and found some components to try out by a company called Litcessory. They make extension cables and connectors allowing you to connect a cut end of a strip, like the one you can see above, onto a cable that leads onto the next section. Just what I needed! There are some negative reviews about these that put me off originally, but I applied my knowledge and experience and took a punt buying them. Unfortunately they sent me the wrong parts to begin with (I was sent splitters instead of cut-end connectors and what was *really* frustrating is that the package was correct, just the items within weren’t!). A reorder saw me right though and I got the job done within a busy weekend. When all four sections were working, I hid the cables up using sticky tape and used the grout lines to disguise them. It’s actually not that noticeable, though in the future I may decide to go with a more elegant solution. The finished result, showing all four sections of kitchen cupboards lit. So, just to be clear, what you are looking at is ONE Philips Hue light strip, not four. Result! It just means I can’t have each section on a separate colour, but I don’t really want that anyway. I’m pretty pleased with it! Of course, this is my favourite! Individual lights can be controlled in the app as well. The Kitchen has both a dimmer switch and motion sensor. They are all numbered to stop them getting mixed up, and as in the earlier list, number 3 is the Kitchen. The motion sensor just turns on the cupboard lights on a low setting when you walk into the Kitchen between midnight and 6am. This just gives you enough light to see what you are doing without blinding your bleary eyes as you get up in the middle of the night! It is also unlikely to disturb anyone sleeping in Bedroom 2. I have tried it and it is pretty cool. This was the simplest room to do. Just a colour bulb and motion sensor. The shade of white you get varies by time of day much like the Hallway and there’s a nightlight setting for when you walk in there in the middle of the night. The above photos show the light on a low setting and the motion sensor. They come with these magnetic holders, which is pretty handy. As with the Living Room and Kitchen, holding down the On button acts as a shortcut to my favourite setting of white ceiling and pink others. Both Bedrooms have dimmer switches but the lights that they control are time-dependent. They control the ceiling lights from 6am to 9pm and from 9pm to 6am they switch over to control the bedside lights. For example, if the ceiling light is on and I press the On button at 10pm, the ceiling light turns off and the bedside lights come on. Neat! The last area to cover is Bedroom 2. This really is just Bedroom 1 again but with one bedside light instead of two, so not a huge amount to say. What’s Good About the Lights? Quite a lot of things. It might be a fad to some, but it is no doubt a cool feature to have in your house and it is not without its uses. Firstly, I can set whatever mood I like to match the occasion. From entertaining guests, to a cosy night in, it’s all covered! There are seasonal effects too, like having all the lights in the house twinkle at Christmas time. Secondly, when I am away for any length of time, I can mimic someone’s presence by controlling my lights while I am away from home, making it a good passive security feature. When I was away at my parents’ house for Christmas last year, I had programmed all my lights to turn on and off randomly, so I could just get on with enjoying the holidays with my parents and not worry about my empty house. Next, the integration with my TV is really nice. Great for movie nights in. You can also sync them to music for a bit of fun, though I have never tried. Also, geolocation – if I leave the house I can have all the lights turn off automatically to save power and prolong the lifespan of the lights (though, as with all LEDs, you can expect to get a good 15,000 hours of on-time out of them anyway). Some of the lights also turn on when I arrive home. It’s as though the house is welcoming me back! I was concerned about electricity usage originally as all the devices are listening on the WiFi all the time even if they are not on, but actually it really hasn’t affected my energy bills at all and the power usage is next to none when lights are not in use. Finally, it all works with Alexa. I can say something like “Alexa, Bedroom 1 lights off”, or “Alexa, make the Living Room blue”. So there you go – you really can turn the room blue with your voice! The cost – though you can just go for the cheaper White Ambience lights if you are not interested in colour, or just colour accent lighting and not having everything Hue. Most of mine are colour and that is why I have gradually built this up over a 15-month period. Really, the cost depends on what you want to do. There are also setups far bigger and costlier than mine! But it just comes down to your budget, time and money wise. Also, power cuts. If the power goes out in the middle of the night, all lights come back on when the power is restored! Thankfully power cuts are rare in my area, but recovery from a power outage in the night is a bit like that bit on Love Island where the lights come on full whack and the islanders get a rude awakening. I think this is so that if the emergency services need to come into your house at nighttime they can still turn the lights on themselves by flicking the normal light switch off and on again, so it’s likely a safety feature with an unfortunate consequence. Overall I am pretty pleased with this project and it sure is fun to use and great for entertaining guests with too. The lighting is always a talking point when new people come to my house. I hope that you found this useful!